Leave it to Texas. They have decided to open a new library…without any books. It might make budgetary sense, but the idea of a library being essentially a Mac Cafe doesn’t sit well with me. Maybe it is just a cultural inevitability, though. I know there have been sales numbers over the past year that has shown the market for ebooks slowing, and that there is a renewed hope for paper and cardboard to hang on as the present and future principle form for books, but I just don’t see it. Not with wages stagnating, population growth and growing urbanization making living spaces smaller, and the general desire to comfortably lug whatever the hell we want with us to wherever we want to take it. Hardcopy books will likely, eventually, go the same way hard copy movies and music appear to be going: towards a niche market. Please don’t buy my book on amazon. Author Jamie Clarke wants you to buy his book direct from the publisher, instead. He has a website up promoting his cause, and I encourage folks to go and check it out. And if you want his book, buy it from the publisher (and get it early!). As always, I support the majority of antiAmazon sentiment, but I’m not familiar with Clarke’s work. I’ll be checking it out, though. Finally, TC Boyle has a new collection of stories coming out. 15 years worth of stories covering 900+ pages. I enjoy Boyle’s work, though I haven’t made enough of a dent in his last collection. Still, I look forward to this one. Here’s a collection of JG Ballard covers done up by James Marsh. I have still yet to make the leap to ebooks, and this is part of the reason. While I know ebooks still have “covers,” an electronic cover is far from the physical thing in your hands. The book cover is one of the primary ways to attract a reader to a book, being literally the first thing the reader sees. Looking through these covers and I know that if I was roaming through a bookstore, and saw these covers on the shelf, I’d have to pick at least one of them up and look through it. They’re just interesting and engaging, they pull you in and make you curious about what past the cover awaits your eye. While I may, technically, be able to see the same “cover” on my ereader, I think it loses something when you remove its tangibility. It becomes just a picture, something to click through, something easy to be discarded. It is no longer tied to the text in any real way. Which might be one of the largest problems with ebooks in general. While they offer great convenience, they also become less important because of their literal lack of weight. You don’t have to make room for the book on a shelf or on your coffee table. You don’t have its bulk continually taking up space, shoving itself before your eyes every time you glance in its direction. Ebooks can be forgotten, lost to the ether of ones and zeroes. While ereaders may have pulled more people than before into the readersphere, they have also helped for this appearance of a product easily ignored, easily removed from thought. I’m a bit late to the remembrance, but Carolyn Cassady has passed away. She was the husband of Neal Cassady, the close friend of Beat legend Jack Kerouac. She wrote her own memoir remembering the Beat scene, that I’ve read bits and pieces of and encourage anyone who is interested in that time and place in American literature to check it out. The whole Beat generation thing seems too often to be overly condensed to Kerouac, Burroughs, and Ginsberg, with everyone else reduced to extraordinarily minor spots – the women especially. Her voice is an important one for perspective on the scene. It shouldn’t be ignored. And the British aren’t happy about the Booker Prize being opened up to American writers. Not much to say, as I don’t entirely agree with the opening the Booker competition up, either. It’s okay for it to focus on United Kingdom born writers. I don’t see how it cheapens the prize by maintaining a narrow focus. If anything, I think it opens the prize up to a nearly impossibly deep well of applicants, where merely deciding on finalists from year to year will become increasingly difficult. Also, there’s nothing wrong with some pride for the UK. Finally, not book related at all, but you can no preorder a massive Bob Dylan collection. Two things are interesting with this. The first is that it is labeled as “volume one,” but it contains all 35 studio titles that Dylan has released, as well as 6 live albums, and another two disks called “side tracks.” Which leaves me to wonder when (or if) volume two is released, what will be on it. It makes me wonder if maybe we will see the material Dylan has used to release his occasional “Bootleg Series” editions released in one measure treasure chest of B side and rarity goodness. It is something I would desperately want, but also be desperately unable to afford. The second curious thing about this collection, is that there is an Amazon exclusive version that is packaged as a harmonica…but has all of the songs on a relatively tiny USB drive. And it’s a hundred bucks more than the conventional collection of CDs, hardcover book, etc. While I think the harmonica thing is cool, you’re also giving up a lot of nice extras – including the physical CDs to keep around as master sources for your own personal rips. I like the idea of the USB stick, but I don’t see how it is worth $365. I’d rather have the box set and all of the tangible swaggy goodness that comes with it. Bookstores…of the future! Okay, maybe not of the future, but definitely a bit of a shift from what we’re accustomed to outside of a Barnes & Noble (or a Borders *sigh*). Add a cafe, or a bar, or a children’s play area (maybe a Happy Meal, too, eh?). A coffee shop I used to hangout at with friends in undergrad was attached to a Christian bookstore, and cafes have long been a staple of the national book chains. It’s also an idea the wife and I have kicked around in our more whimsical moments. “Hey, let’s open a bookstore!” “And then file for bankruptcy!” We even had a grandiose dream at one time of having a restaurant/bookstore/coffeebar. Yeah. I applaud anyone taking the leap of opening a bookstore and attempting to incorporate such things into their plans. I hope it works, and I would try to support your endeavor. That said, I think it’s a long haul through two feet of financial woe. Still, sell a good spice cake and I’m there. Sticking to the UK, there is a massive piece in The Guardian centered on Stephen King. I’m an unabashed King fan. I have had a more difficult time getting into his newer stuff, which may in part be from my own reading interests shifting over the years, but King is the guy who got me back into reading when I was in middle school and came across Eyes of the Dragon on the school library bookshelves. to be honest, I’m still slogging through this interview, chipping away at it throughout the day when I have the opportunity. And the BBC caught up with Bill Bryson who wants his cake…and digital books, too! He’s lobbying for publishers to package a digital copy with a normal printed copy, so when people buy an actual book, the digital book is packaged with it in some way. I get what he’s saying, and I’m not against it. We’ve seen movies package a “digital copy” with their DVDs, and music CDs are so easy to rip that a digital copy isn’t necessary (especially since it seems most music is bought digitally – maybe they should start packaging CDs with each download?). Something I’d be curious about is a digital subscription to my favorite publishers. For ten bucks a month, let me “join” Penguin and be able to read a selection of their library. Sort of like a Netflix for books. They could limit what was available, though if it is too limited no one would have any interest, and control the distribution/downloading. Also, they would have an opportunity for a treasure trove of information about their readers likes, dislikes, and habits. it would almost be enough to get me to buy an ereader. I’m a third of the way through Adam Levin’s doorstop The Instructions and I’m not yet sure what to make of it. It’s interesting. The characters are engaging, and easy to forget that they are meant to be middle schoolers not yet likely old enough to have hair in their arm pits. They talk with eloquence, even when they are vulgar. There are moments where it feels more as if I am reading an adapted Shakespeare than the story of young children building up for war. That is a bit of a problem I have with the novel as a whole. It feels as if Levin has the ages and stages of his characters just off a bit. And it isn’t the language that does it. The protagonist, who may or may not be the messiah, repeatedly talks of love and places himself into situations that are clearly beyond his years. This is a trick that can be pulled off. We saw it in the movies with Rian Johnson’s Brick where a gritty noir story line is paired up with high schoolers, but you never forgot that the characters were high schoolers. Johnson would continually drop little bits of life into the created environment, lending it a bit of reality. It kept the gimmick grounded. With The Instructions, I haven’t gotten that (yet). Maybe their childness will make itself known in the last two thirds of the novel, or maybe I’ll just see it differently as I trudge on. I doubt the latter will happen, though, because this has become quite the sticking point for me. At some point, it doesn’t feel like I’m reading about children any more and that is one of the major points of interest for me. I care less about adults having these issues or speaking in such a way. The way the kids communicate isn’t far removed from how I hear many adults interact, especially in my work environment (academia). It’s just less interesting. However, while the idea of it gains interest when layered over children, transforming their day to day acts and lives into a bit more of high theater, it’s still a gimmick unless it means something, unless it accomplishes something, unless it gives does something to the story to give it greater depth. Librarian tattoos! Have to admit, I’m partial to the tarot card librarian. An article about JD Salinger from NYT. Personally, I don’t see the appeal of Salinger. I could get into Catcher in the Rye in high school, but have been wholly unable to revisit it as I’ve gotten older. His being a hermit, however eccentric, doesn’t hold any interest for me, either. It’s his life, and more importantly he’s a writer who hasn’t published in how many years? Still, I know he interests others and the article is well done. So here it is. The Huff Post has 11 books you should re-visit. I disagree about Catcher and Romeo and Juliet, but agree with the rest. If you’re going to revisit Shakespeare, there are other players I’d go back to before the ill-fated love affair bit. It’s been awhile since I’ve done this, and it is most certainly not like getting back on a bicycle. If the author sounds familiar it’s because you probably have a memory of him from a much different setting: he was the Jeopardy wunderkind who spent several months as the champion of the world’s best known trivia show. 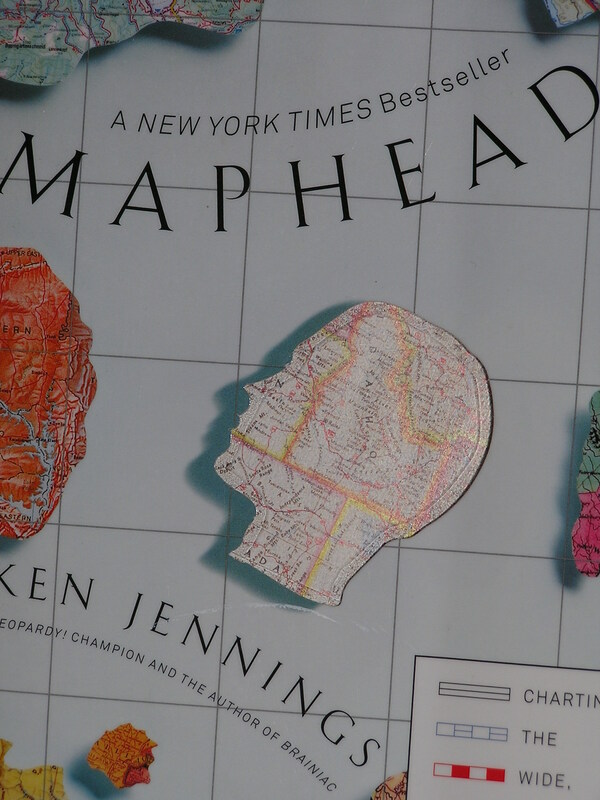 Maphead is a memoir of sorts, journeying into Jennings’ love of geography, and into the physical incarnation of all things spatial, maps, but into our perceptions of maps and geography, and their place in the world. Their importance to how our minds work, how we work, and what we may be losing with the ubiquity of Google Maps on our iphones so quickly taking the stead of the dogeared tome crammed into that pocket on the back of the passenger seat of our cars. The various riffs on maps, culture, and geography are engaging and entertaining, but I found it was the side roads that stuck in my mind. For instance, there is one brief foray into stats for children abductions and how “only” 115 children are abducted by strangers every year (assuming on average and in the US, and not that there is some sort of limit imposed by a secret board that regulates children abduction and only allows for 115 to be plucked from the wild every year). in other words, it’s literally a one in a million chance, but it’s a fear that’s on every parent’s mind whenever you venture somewhere the least bit populated with a hectic crowd and a child’s hand clutched in yours. It is used as a single example of how we may be slowly weaning out our ability to think spatially, to understand and interpret our environment in a way that allows us to meaningfully navigate our world by our senses and by our intuitions rather than through an app we downloaded to our phone. This loss isn’t without some ever more serious implications as our continued lack of exercise of the abilities required to use something like a map to literally find our way through our world may play a part in shrinking our hypothalamus and a corresponding increase in dementia rates happening at earlier ages. Thinking back on the book, I still can’t really pull any one thing from it. It is amusing, it is entertaining, and it is sprinkled throughout with things that stick in your mind a bit before vanishing into the ether. At the same time, they do vanish, which perhaps says more about me than about the book. What I am left with is a sense of importance of maps, and how they fit into our lives. We are living maps, in a way, a record of navigation and routes. Of the terrain we travel. A literal map of Atlanta or Qatar are but the simplest examples of the maps we construct, and maps are but the basest symbol of the much larger field of geography. it’s worth the read. You are currently browsing the Loose Leaf Bound blog archives for September, 2013.